Lindsay Lohan Off the Wagon! My New Years prayers have been answered! Lindsay Lohan is fun again! 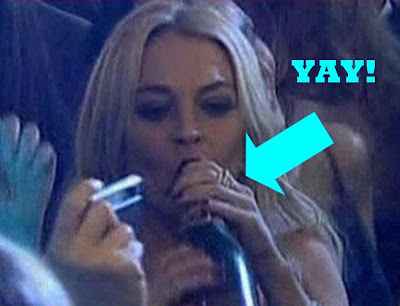 My friends over at TMZ.com (they don’t know who I am) spotted Lindsay playing sucky-face with a bottle of champagne on New Years Eve in Italy. Yay! Like a moth to flame. Linday’s lawyer did confirm with TMZ.com that Lindsay did in fact have some swings of champagne, but stopped herself that night, called her sponsor, and got herself immediately on the right track. I say, BORING! Look, Lindsay, whilst drinking, is hotter, funnier, prettier, a better actress, a better singer, more social, and frankly more special. I say 1 bottle of champagne per day and you’re good to go. It’s that wacky crystal meth that can really get ya! Ugh, anyway, hopefully we’ll be seeing more of Lindsay and her champagne addiction throughout the year. Nobody likes a sober celebrity.